The robustly developing economic conditions across a majority of Latin American nations have indeed expedited LATAM frozen bakery market as the modern retail space continues to foray in the region to capitalize on the opportunities generated by the growing margin of disposable incomes. The shift of food retail firms has well-positioned the providers of the frozen bakery products across the region and has allowed them to accumulate considerable gains over the previous couple of years. 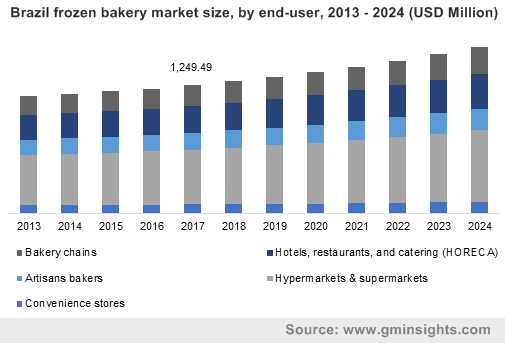 Driven by the substantial expansion opportunities in the region across the food retail sphere, the LATAM frozen bakery market is primed to witness extensive growth over 2018-2024. The industry is also said to be powered by the ongoing expansion of several restaurant chains as well as fast food outlets across nations such as Mexico and Colombia – some of the most visited vacation destinations across Latin America, in an effort to capitalize on the influx of vacationers, which is rapidly growing on a yearly basis. Bread forms the basis of most baked goodies, specifically across LATAM, making bread-based frozen bakery products a prime revenue generator of the regional industry. The rising margin of disposable income has ensured the sustained growth of specialty food products such as the ones offered by U.S-based Hostess Cakes as well as Mexico’s Grupo Bimbo. When considered through a volume based perspective, the LATAM frozen bakery market is slated to be governed by the bread segment, which is projected to make up for the lion’s share of the overall market. Indeed, bread is predicted to account for an unprecedented 63% of the LATAM frozen bakery market share by 2024. The rapidly increasing rate of bread consumption in the region would be the primary factor that would be fueling the growth of LATAM frozen bakery industry. The potential of growth is further supported by the 2017 annual report of fast-food giant, McDonald’s, which reportedly claims that the company’s comparable sales inside the foundation markets rose by approximately 9% and the comparable guest count going up by about 3.3%, with Japan as well as Latin America leading the charge with significantly strong performances. Colombia is quickly rising as a prominent player of the LATAM frozen bakery market. One of the major reasons behind the projected growth is the nation’s rising prominence as must-visit vacation destination which has prompted advancements across as plethora of different retail channels across the nation. The growing number of hotels, restaurants as well as other food-related outlets that are popping-up across tourist hotspots inside the nation have also led to a rapid increase in consumption of an array of different bakery products such as cakes, pastries and breads. According to a 2016 report by the Colombian Chamber of Commerce, there are more than 32,000 restaurants and food outlets inside the nation’s capital of Bogotá alone. These factors have also attracted investments from large multinational corporations such as Europastry, which according to its 2017 annual report, established its presence in the Latin America market to capitalize on the projected future growth. On these grounds, it would not be incorrect to quote that Colombia would emerge as the go-to growth avenue for prominent stakeholders of LATAM frozen bakery market. Indeed, Colombia frozen bakery market size has been estimates to register a CAGR of more than 6% over 2018-2024. Powered by the presence of numerous business expansion opportunities in the hospitality and the F&B sectors, the LATAM frozen bakery market is projected to witness an incredible growth rate in the years ahead. According to Global Market Insights, Inc., the increasing rate of consumption of different baked products across Latin America and the proliferating economic growth in the region are expected to turn the LATAM frozen bakery market into a $5.7-billion industry by 2024.